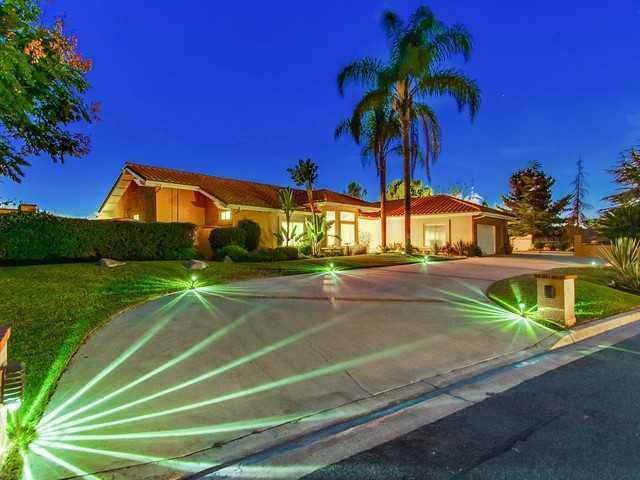 Single level w/mtns,hills & sunset views, circular driveway, updated kitchen, SS appliances, wine cooler, granite counters. Wood flooring in LIV, DIN & 1BR, newer tile flooring thruout KIT, FAM, entry & hallway. Newer carpet in 2 BRs. FAM features FP & slider doors to patio. MBR w/slider door to patio & ensuite BA w/separate shower, soaking tub & dual sinks. Pool w/newer filter, variable speed pump & controller. Hot Springs spa. Solar panels(leased),elec bill under $300 for 12 mos. Newer HVAC, RV parking.